2017 Geronimo Mateos Special Chorus | BlogSpain's most revered builder pays tribute to this classic Di Mauro model! I purchased this guitar from Michael at Djangobooks.com, and am equally satisfied as I am surprised by the unique sound that this guitar makes. First off, I’m no expert at describing or critiquing what makes for a better or worse sounding guitar, but I have been playing guitar in many styles for over 30 years and have been in almost every style of band or group short of Zydeco. Please take the following musings with that in mind. If I could best describe the sound, it’s punchy, mid-range focused, and LOUD. Acoustically, it sounds very much like the vintage recorded sound of 1930s-era Django, the recordings of gypsy jazz contemporaries like Duved Dunayevsky which are mixed to sound “old”, or likewise, Gonzalo Bergara’s album, Djangophonic. Strangely (or just by nature of this guitar design), it resonates this vintage sound quality on its own without the 80 year-old recording equipment or the modern methods used to replicate the classic sound. As mentioned, the Mateos Special Chorus is surprisingly loud. It doesn’t take much effort to project, which gives me a lot of opportunity to play with a wider range of dynamics; playing gently, the notes are still front and center, not timid. 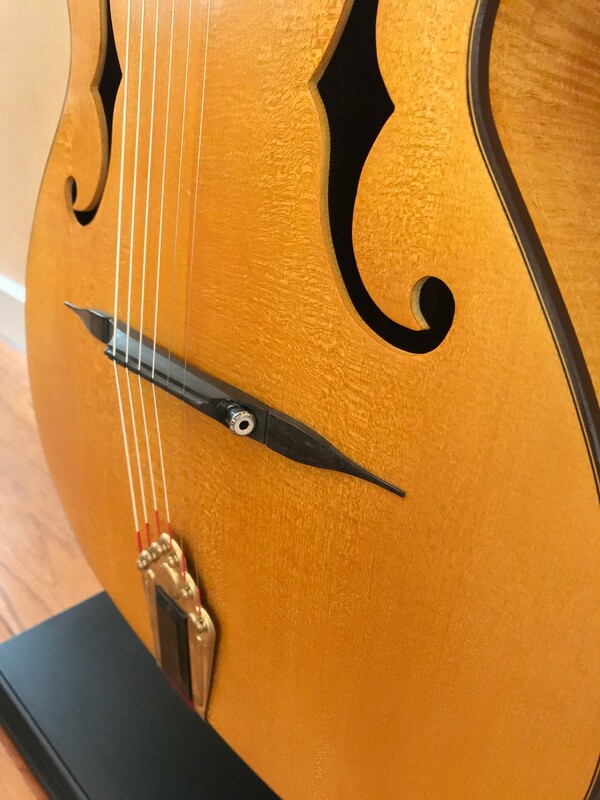 Play with force, and you get a “bark”(with exception of the D string - see more on this below) that’s got weight and presence that neither my European made oval hole traditional or Asian D-hole come close to matching. So imagine the 1930s Django sound on recordings like Limehouse Blues, My Serenade, Shine, and I’ll See You in My Dreams, but that sound coming straight out of the guitar without old mics or sound processing. Now take that same sound, and imagine it about 25% louder than most Selmer-style oval or D-hole guitars (subjectively speaking, of course). By my ears, that’s what the Mateos Special Chorus produces. The one downside I could imagine is that the sound quality that gives this guitar its unique character is maybe too different than what many gypsy jazz guitar players would come to expect from a Selmer-style guitar, especially if their ears are solidly tuned to the “modern” recordings or the sound of modern versions of Sel-Mac guitars being played in a live jam or performance. It doesn’t have the sonic mix of crisp, sharp, fret-buzzy-ness that some typically associate with the jazz Manouche sound we’ve heard in recordings by artists of the last 35 years. The Special Chorus isn’t quite “arch top” in sound quality either; and although I’d say there are some similarities, I think it sounds closer in overall character to a Selmer-style guitar, but with a “contained” tone; significantly less ringing and buzz. In most other genres, that’s usually a “plus”. For gypsy jazz, some my find it as a deficiency. Metaphorically, if we were comparing sound characteristics of reed instruments, I’d say the Special Chorus is more clarinet-like, whereas the typical oval-hole sound is more tenor saxophone-like. It’s a strange type of comparison, but I think it illustrates difference in timber more than anything else. Conversely, one could say this is an advantage in getting your notes to stand out from the crowd in a group environment, both in tone and timbre, and definitely in volume. If you’re shy about your playing, then it’s probably best that you avoid this guitar. It won’t help you blend into the background without really making a hyper-conscious effort to do so. Do you know that type of person who seems to talk louder than everyone else but isn’t really trying to? That’s the Mateos Special Chorus, but in guitar form. The ONE sound-related issue that I’m not quite sure yet as being an actual issue, is the timbre of the D string. It seems to be slightly more “mute” in both volume and timbre than the other lower/baritone strings. Now, this is something I only take notice of when playing the string individually or any frets on that string. When playing chords or melodies, it’s difficult or near impossible to pick up on it. However, as the guy playing the guitar and examining every millimeter of sight and sound that it is, I notice it. Still, I’m not quite sure it’s an actual deficiency or just the nature of this f-hole Sel-Mac design. 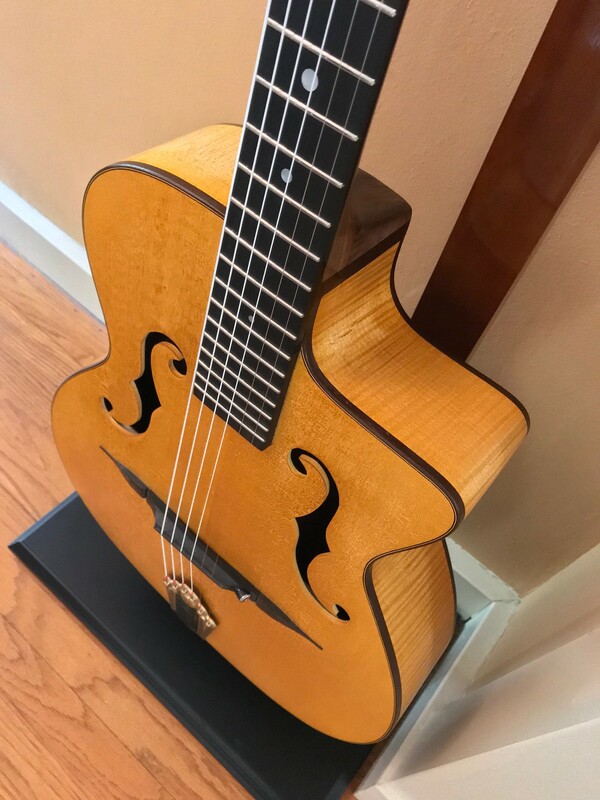 I remember the first time I played a “decent” Sel-Mac guitar after messing with a Cigano student model for about year and being shocked by how brash and buzzy that $4000 gypsy jazz oval hole guitar sounded to me. Fast forward, and that sound is now what I’ve come to expect from a gypsy jazz guitar and it’s no longer strange to my ears (now that I can actually play the style with some level of confidence and technique). I think I need to live with the Mateos longer to see how much the D string thing really stands out or not. The Special Chorus also comes with a piezo-style pick-up cleverly integrated into the bridge with a 1/8” mini-jack input jack protruding (subtly) out the treble side of the bridge. The obvious advantage is that it doesn’t require the maker to drill into the body of the guitar for wiring and fixing a 1/4” input jack to either side or bottom of the lower bout. The supplied 1/8” to 1/4” chord is relative unobtrusive visually because the wire itself is much narrower than your typical instrument cable. Without using my handy caliper, I’d guess it’s about 2.5mm in diameter. The effect of the sound of the guitar plugged into my acoustic amp (Ibanez Troubadour T30) is fairly predictable compared to other acoustic guitars with piezo pick-ups I’ve played. To my ears at least, every acoustic electric with a piezo seems to add “round-ness” to the sound when plugged-in compared to being played just acoustically. I was immediately drawn to the photos on the djangobooks.com product page. It is as beautiful as those photos lead one to believe. HOWEVER, what surprised me when I first opened the case and saw the guitar in-person, was the satin finish of the guitar. Even though in the description it’s clearly stated a “light, oil based finish has been applied”, my mind hadn’t translated that into the visual finish that it produces. That said, I’m not disappointed by it, it’s just not what I expected. Still, it’s a good kind of surprise. It really is beautiful. The flamed maple sides and back ironically wax nostalgic for me and my younger days in the 80s when those Paul Reed Smith electric guitars were so tempting yet so out-of-reach financially in my college long-haired rocker days. The satin-like oil finish does expose more of the raw wood and construction characteristics compared to a thicker glossy polyurethane finish that fills in all the gaps. In turn, the light finish probably contributes to the overall weight of the of the guitar, or rather, the lack thereof. It’s a featherweight. Overall, finish and construction-wise, it’s meticulously well made, and about what I’d expect from a guitar in this price category. I'm told that the Mateos was set-up by Josh, Djangobook’s tech, so I can’t speak for what it was like to play straight from the manufacturer. The fret edges are buttery smooth and the action, while a little higher than my other guitars, only took a few minutes to get used to playing the faster arpeggio runs that I’m used to playing. Eyeballing it, I’d say it’s about 3mm. Still, it’s playable and comfortable. Pull-off’s maybe take a little more effort, but the additional volume helps. The neck is a little deeper and rounder than my Altamira but slightly more shallow than the very “robust” neck on my Castelluccia. The tuners feel really nice and smooth. Intonation is good and the notes are clear up and down the neck. One huge difference in feel compared to other guitars I’ve played is the physical feeling the guitar body transmits to my stomach and chest area. The sound box on this guitar is the most “alive” than I’ve ever felt on any other guitar. You literally feel the vibration from the guitar body with every pick or strum, like a small sub-woofer against your own body. I haven’t spent too much time with the Mateos, but I can say my initial impressions are all positive, albeit some things like the finish in-person did challenge what I perceived it to be just by looking at the photos online. Still, I’m not disappointed by that. It looks great. The sound isn’t subtle, and it doesn’t take a lot of effort to get a big sound out of it. That said, the tone is highly-defined, warm, and pleasant, albeit perhaps a little less “conventional” than the stereotypical gypsy jazz guitar sound. Still, it’s that quality of unique tone and ample volume that I think could help it stand out from the rest of the group in a jam or show (in theory). The fit and finish is worthy definitely worthy of the price of the guitar, and the bonus of the cleverly hidden pick-up pushes the value beyond the price, in my opinion. I’d say that maybe my other two Sel-Mac guitars are a fraction more easy to play, likely due to the slightly lower action on those guitars. That said, it takes less effort to get a clear and definitive note on the Mateos compared to the other two because of the immediate volume it produces and the compressed tone. Lastly, I’d be remiss not to mention the cosmetic attraction I have to this guitar just because it just stands out from my other two gypsy jazz guitars. I’ve never seen another f-hole Selmer-style guitar being played in the numerous jams and few live shows I’ve been to, Di Mauro or otherwise. There’s something I find attractive about the unconventional. I think the Mateos Special Chorus checks that box in several charming ways, both in looks, and especially in sound. The D string thing could just be one bad string. I've had that happen before believe it or not. Try playing the same fretted note on the 3rd, 4th and 5th strings and compare them. Or just try swapping out that one string and see if that helps. How is the bracing on the top and back set up on this? Is it a dome top or does it have a bend (pliage)? Looks awesome! Thanks for the review. @Brad Herman - Thanks. The unspoken agreement between my wife and I is that "one guitar in" means "one guitar out", so I'll be selling another D-hole (not the Altamira) that I have. Space is at a premium in our household too. @Bones - I actually did a similar type of test as you describe on most frets. I also did change the D string and it didn't have any effect. It's a dome top, no pliage, but has a VERY rounded back. That last photo shows how pronounced it is. As far as the bracing goes, I have no idea, but my guess is ladder bracing. Hmmm, sorry the string change idea didn't fix it. Maybe something to do with the bridge, nut, or tailpiece? Does it do it for the open string too or just fretted notes? I'm thinking if it is just the 4th string (i.e. not the same notes fretted on other strings) it isn't the response of the body, rather something to do with how the string is supported at either end. Maybe just play it in for a while and see if you can get a sense of it. @Andrew Ulle - I agree! @Bones - Thanks. It has the tonal quality even when I pluck the open string. I’m leaning towards your theory about it being either the nut or bridge. My guess is bridge. Maybe the groove is too tight. That said, the more I play it, the less I notice it. 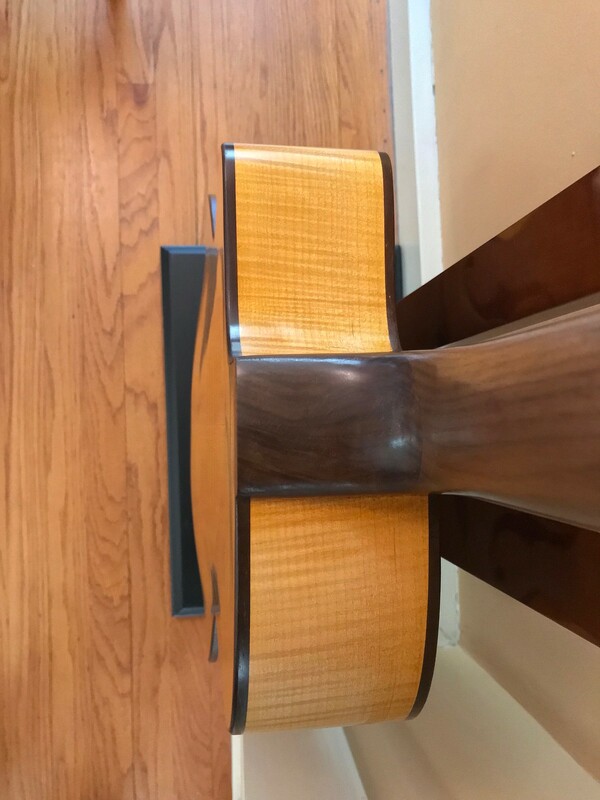 I have a local luthier who builds acoustic guitars that’s done bridge work on my Altimara. I’ll bring it to him for his thoughts. As for owning multiple guitars, well, between the many I already own, my son’s drum kit, his cello, his bass guitar, multiple amps, pianos, xylophone, congas...it’s like a freakin’ Sam Ash at our house! There’s some practicality to this rule. I’d call my collection complete w/ one of these, a Stankevicius guitar, and a nice archtop. But living in a small apartment in San Francisco makes it a bit rough with a wife and two roommates. @Brad Herman - Well, with a list like that, how could you every part with any of those, right?! Good on you! 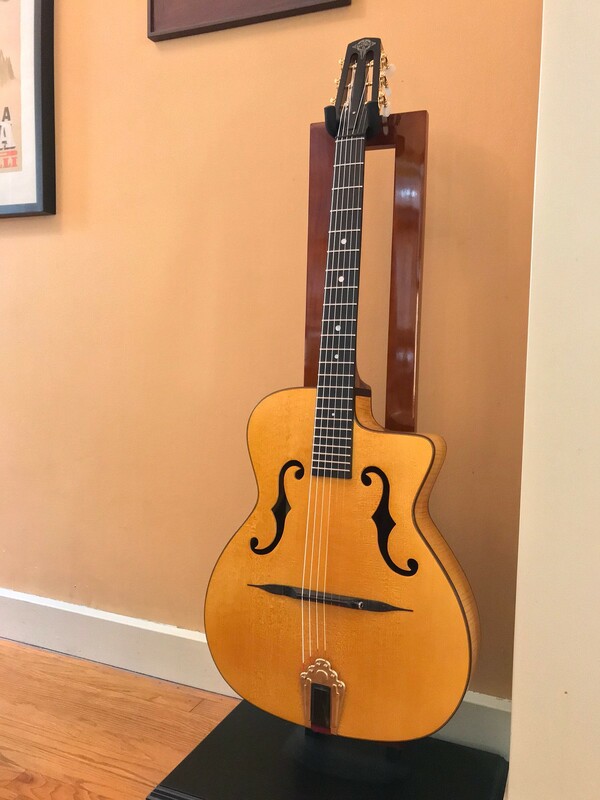 @Brad Herman - The unspoken agreement between my wife and I is that "one guitar in" means "one guitar out", so I'll be selling another D-hole (not the Altamira) that I have. Space is at a premium in our household too. As long as my wife keeps buying shoes and not keeping a "one pair in, one pair out" rule, I'm not subscribing to such an agreement. My limitation, however, is household cash flow shortages (probably due to excess shoe purchases).